P. Gotz discovered asteroid #568 Cheruskia. C. A. Wirtanen discovered asteroid #1951 Lick. The US Air Force launched Explorer 4 into orbit from Cape Canaveral, Florida, which mapped project Argus radiation. Explorer 4, launched 26 July 1958, was a cylindrically shaped satellite instrumented to make the first detailed measurements of charged particles (protons and electrons) trapped in the terrestrial radiation belts. An unexpected tumble motion of the satellite made interpretation of the detector data very difficult. The low power transmitter and the plastic scintillator detector failed 3 September 1958. The two Geiger-Mueller tubes and the cesium iodide crystal detectors continued to operate normally until 19 September 1958. The high power transmitter ceased sending signals on 5 October 1958. It is believed exhaustion of the power batteries caused the failures. The spacecraft decayed from orbit after 454 days on 23 October 1959. C. Hoffmeister discovered asteroid #2183. NASA and the USAF launched X-15A Aero stability and drag test mission # 64 in which Neil Armstrong reached a maximum speed of 6420 kph (Mach 5.74) and a maximum altitude of 30.145 km. A "roller coaster" descent was used to simulate an emergency reentry. The Syncom 2 communications satellite was launched, the first spacecraft placed into geostationary orbit. 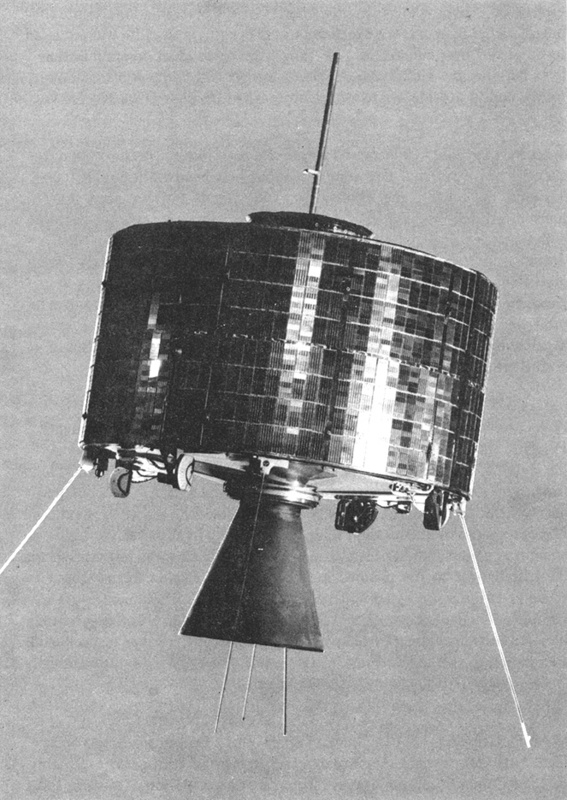 Syncom 2, launched 26 July 1963, was the first geosynchronous satellite. Although its orbital period was 24 hours, and the spacecraft remained at a nearly constant longitude, the orbit was inclined 33 degrees with respect to the equator, so it was not truly geostationary, but moved in an elongated figure eight pattern that stretched 33 degrees north and south of the equator. Syncom 2 was an experimental communications satellite placed over the Atlantic Ocean and Brazil at 55 degrees W longitude. It began regular service on August 16th, and demonstrated the feasibility of geosynchronous satellite communications. Voice, teletype, facsimile, and data transmission tests were successfully conducted between the Lakehurst, New Jersey ground station and the USNS Kingsport while the ship was at sea off the coast of Africa, and television transmissions were relayed from Lakehurst to the Telstar ground station at Andover, Maine. The Syncoms were forerunners of the Intelsat series of satellites. Syncom 2 was launched into a high altitude orbit from Cape Canaveral on 26 July 1963. Six hours after launch, the apogee motor was fired to place the spacecraft in an orbit ranging from 34,100 to 36,440 km with a drift rate of 7.5 degrees per day eastward. The apogee was then raised, and the drift rate changed to 4.5 degrees per day westward, toward the desired position over 55 degrees longitude. After two weeks of drifting, the nitrogen jets were pulsed in a series of four firings to slow the spacecraft to near-zero drift on August 16, followed by an alignment maneuver. The final orbit was geosynchronous with an inclination of 33 degrees. Operations were turned over to the Department of Defense on 1 January 1965. The Syncom satellites were 71 cm diameter x 39 cm high cylinders, with a fully fueled mass of 68 kg. The nozzle of the solid propellant apogee motor, a 1000 lb thrust design used to impart a velocity increase of 1431 meters/sec, extended from the bottom of the cylinder, and a co-axial slotted array communications antenna from the top. Total height, including the nozzle was 64 cm. The radial exterior was covered with 3840 silicon solar cells, providing 29 watts of direct power during the 99 percent of the time the spacecraft was in sunlight. Nickle-cadmium rechargeable batteries provided power when the spacecraft was in the Earth's shadow. No active thermal control was required. Most of the central interior of the spacecraft consisted of the tanks and combustion chamber for the apogee motor, around this were arranged two hydrogen peroxide and two nitrogen tanks, and the electronics. Attitude and velocity control was provided by nitrogen jets to align the spin axis, and hydrogen peroxide jets to position the satellite. Each system had two jets, one parallel and one perpendicular to the spin axis. Syncom employed a redundant, frequency-translation, active repeater communication system designed to handle one two-way telephone or 16 one-way teletype channels. The dual transponders utilized 2-watt traveling wave tubes. Receiver and transmitter selection was made by ground command. One receiver had a 13 MHz bandwidth for TV transmission, the other a 5 MHz bandwidth. The receiving gain was 2 dB through the slotted dipole antenna. Signals were received on two frequencies near 7360 MHz and retransmitted on 1815 MHz. The slotted dipole transmitting antenna radiated a pancake-shaped beam 25 degrees wide with its plane perpendicular to the spacecraft spin axis. There were also four whip antennas oriented normal to the spin axis for telemetry and command. Intelsat 3 F-5 was launched from Cape Canaveral, Florida, but a third stage failure left the communications satellite in an unusable orbit. N. Chernykh discovered asteroid #1836 Komarov. 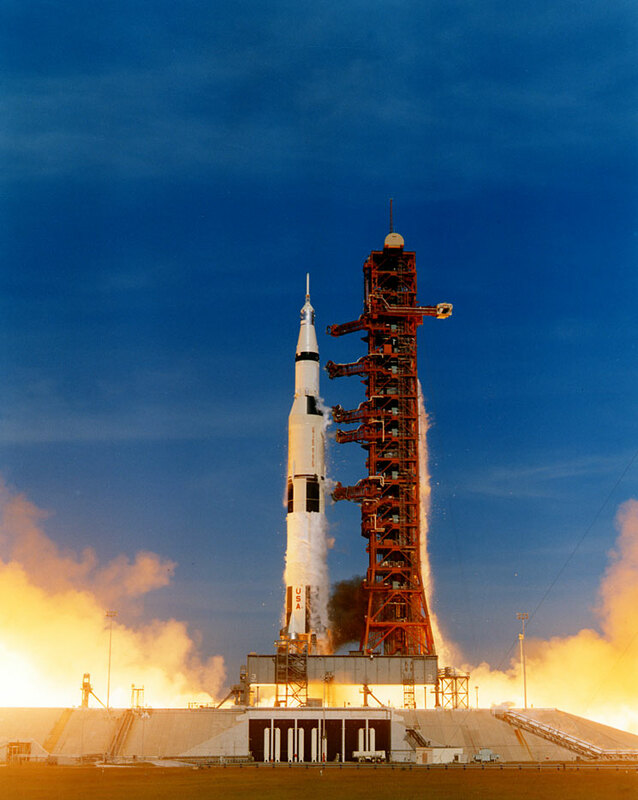 NASA launched Apollo 15 (SA-510, CSM "Endeavour" and LEM "Falcon"), the fourth mission to land astronauts on the Moon's surface. USSR Soyuz 18 landed after cosmonauts Kilmuk and Sevastyanov has spent a record 63 days in orbit at the Salyut 4 space station. E. Bowell discovered asteroids #2845 Franklinken and #2882 Tedesco. Light flashes were seen on Jupiter's moon Io, believed to be a reflection of an event that occurred on Jupiter's far side. USSR launched the Meteor 3-2 weather satellite from Plesetsk for continued improvement of the meteorological system, including testing of information gathering and measuring apparatus, and of remote sensing methods. During the 3h 31m Mir EO-6-2 EVA, cosmonauts Solovyev and Balandin dismantled equipment and temporarily closed a damaged hatch on the Mir space station. To keep the Glonass network operating, Russia reportedly invited China to join in financing the satellites. An operational system would require 24 satellites, by mid-2000 only 14 were in orbit, 8 fully operating. 1.5 billion rubles a year was needed. Russia's Zvezda living module docked with the Russian/US Zarya/Unity stack, forming the basic core of the International Space Station.